Since its peak at 1421 S&P index has given up 4%. Clearly markets are in correction mode in the beginning of earnings season. The question is how long it could last. 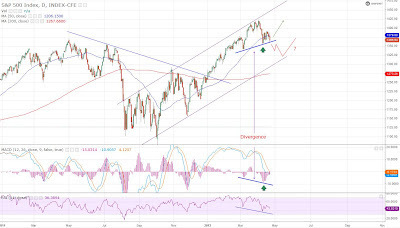 One technical pattern such as divergence between index value and any other technical indicator could be used to determine a change in trend direction. 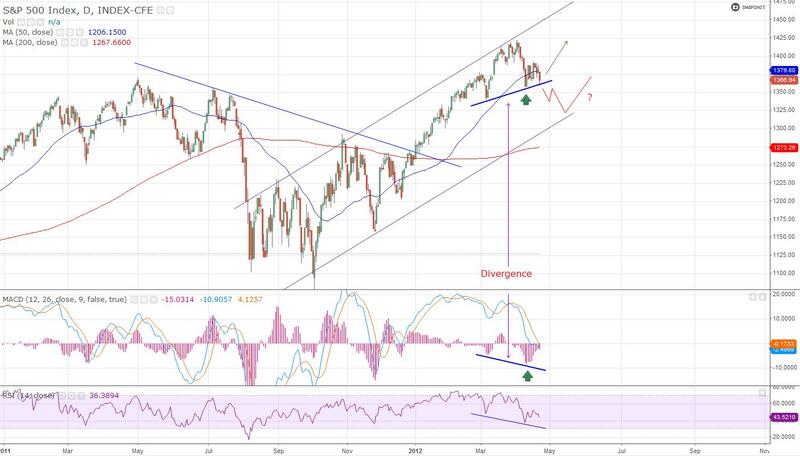 Recently divergence has been spotted in the S&P500 chart between the index and moving average convergence divergence indicator. Usually this technical pattern is a sign for trend reversal, which means that current correction might be at the end. Breakthrough under the resistance line, however, is possible if markets remain pressured by fundamental instability coming from Europe’s fragile financial and political situation. Last could be market concern for the near future. 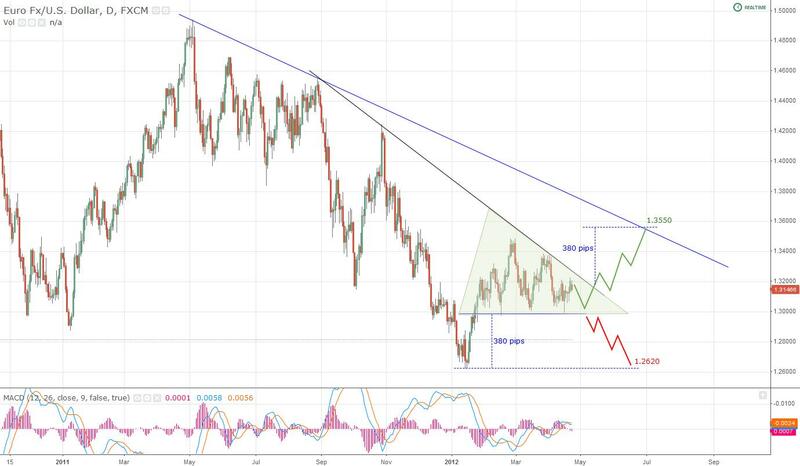 Since the end of January EURUSD has traded in triangle consolidation. The Euro appreciation has been stopped by returned concerns about debt position of Spain and Italy. In addition uncertainty about French elections and upcoming Greek one are fuelling market volatility and rising investor indecisiveness. Such market environment is precondition for technical triangle formation - consolidation. This figure usually is trend confirmation sign, which means that next target could be 1.3550. However, if key support line at 1.30 is broken, than 1.2620 would be reachable. The last is less likely as it would happen if stock market continues with the correction, but still important to consider. 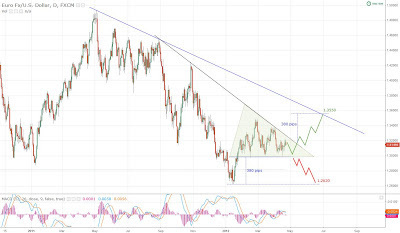 Mentioned target levels are determined by two technical formations that could appear in case of positive or negative breakthrough of the triangle. If the triangle is broken than the following move could be as much as 380 pips the length of the move before triangle was formed. In the positive case the target is limited by cross point of 380 pips length and the trend resistance (the blue line). In the downward case the technical figure “head and shoulders” could be shaped. Some stocks tend to move in cyclical patterns. The reason usually is seasonal deviation in earnings for cyclical industries such as raw materials and heavy equipment, consumer cyclical. Setting aside fundamentals and close observation of the long term historical charts could spot the same conclusion for the repeated patterns. However spotting repeating share price movement could benefit investor with lower risk investment. I have observed 8 year historical chart of the technological company Qualcomm. Share price peaks and bottoms tend to repeat each year in interesting pattern. The price registers its max in the first half of the year, usually during spring time, followed by sharp drop. The bottom in most of the cases in the eight year period of observation is in summer months - 75% (6 out of 8 years). That is because of the two exceptional years that have brought markets to extreme conditions: 2008 – the crisis burst year and following stimulus driven 2009. On the chart light red shaded areas show the time period of each bear move for Qualcomm shares from the beginning of the year to the year bottom. As you can see for all years first half is in red. 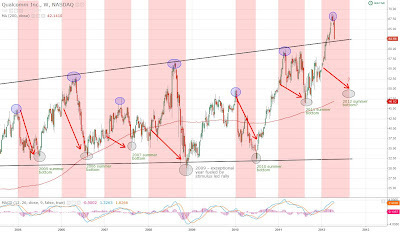 Now if we follow the pattern logic for current 2012 we could expect that next stock direction is south. That might be the case as the price has already formed its peak at $68.80 and started declining. 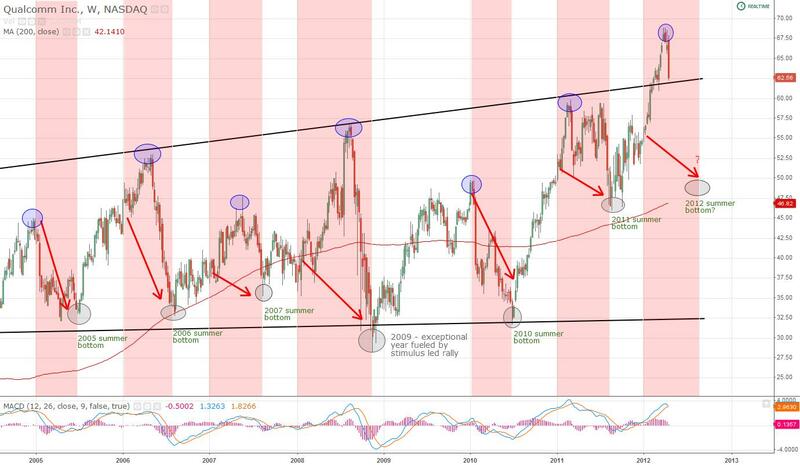 If the slide continues the pattern could repeat itself again this year and next target for QCOM would be around $50. There's been widespread discussion regarding valuation of the most successful social network. With IPO knocking on the door speculations are growing. 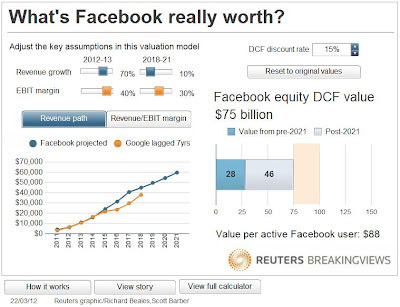 Reuters Braking Views has invented value calculator which helps overall investor to manipulate Facebook value driving forces and the valuation range considering certain assumptions. One clear advantage of the model is the ability to manipulate the inputs which gives you option for dynamic valuation. Back to valuation the Reuters authors have set input numbers similar to the Google pre IPO period returned 7 years back. That is impressive 70% per year revenue growth for the next two years, followed by moderate 10% for the 2018-2021 period, EBIT margins falling from 40% in acceleration period to 30% in post acceleration period and 15% discount rate. With those assumptions the output data shows $75 billion valuation of which $28 billion from pre 2021 and $46 billion from post 2021. However the number $75B means nothing if not compared. For non-public company comparison may be done by observing deals of the private investors. 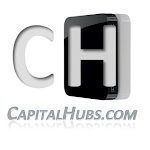 As to January 2012 the company value based on the private secondary markets is $83.5B. After filling for the IPO on 2nd of Feb valuation jumped to $94B and then fell. 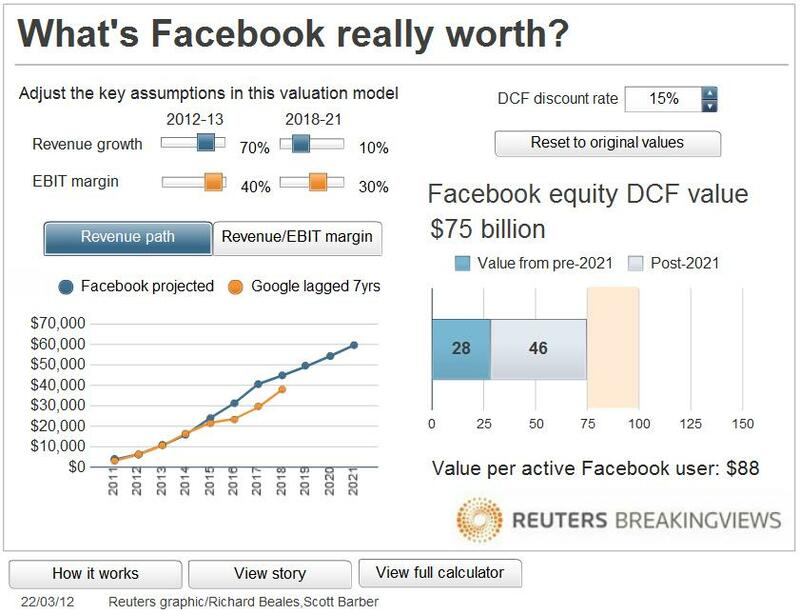 All that numbers compared to the value of $75B based on the optimistic growth assumptions we’ve got an overvaluation. When comparing mentioned values one should consider the sensitivity of the Reuters model to changes in all input data especially in discount rate. 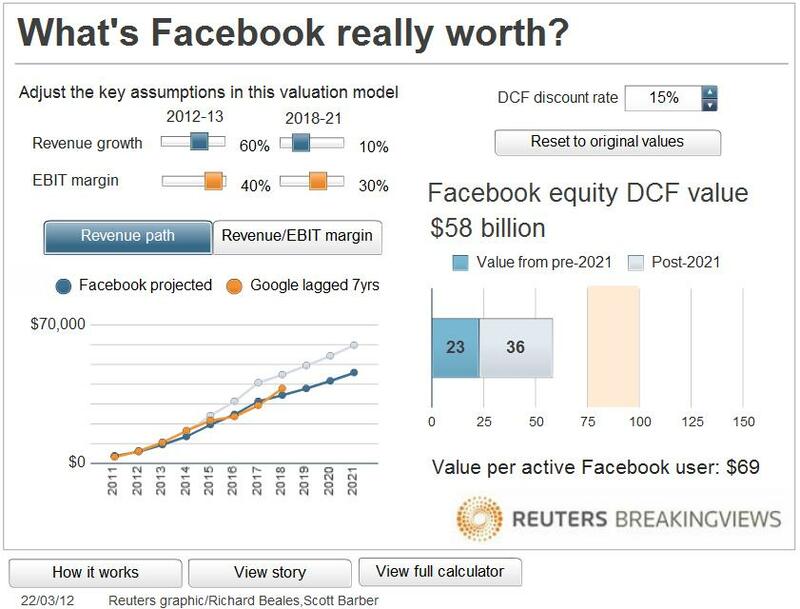 If, for example, Facebook revenue growth rate falls from 70% to 60% (still considerable number) in the growth period the valuation drops to $58B! On the other hand recent FB corporate activity continues to “poke” investors. By taking public attention the IPO interest is constantly growing. Move like FB buying Instagram, photo sharing application, could be considered as such. Probably the social giant won’t stop with that purchase only. According to some analysts Mark Zuckerberg is trying to improve company's profitability. Interesting question is how Instagram functions would be monetized to bring value to Facebook? The IPO is coming and it would be good for investors to make objective judgment before attending the big party. Weather Facebook is going to trade as 100 $billion company or less it is about to be seen soon and is clear that this May is going to be interesting. Reuters calculator could be found here.